Advanced video editing features made easy through a simple interface. You don’t need to be a pro to create great movies. Start projects on one device and pick up where you left off on another. Works on any Mac or PC computer browser, Chromebook, iOS, and Android device. Use your imagination, not automation. You’re in complete control with text, transitions, motion effects, green screen and much more! * Per-video publish options starting at 1080p for $2.99 and 4K for $4.99. How is WeVideo for Schools different from individual accounts? WeVideo for Schools was designed especially for an education environment and schools, teachers and students. The account is managed by school technology or teaching staff and purpose-built to provide students a walled garden environment for creation and collaboration that meets strict privacy and security regulations. 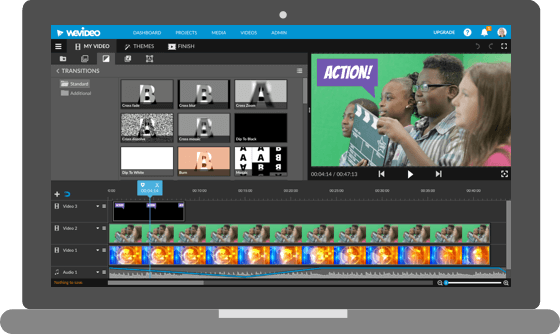 More than just a video editor, WeVideo sparks creativity with tools for collaboration, green screen, screencasting, voice recording and much more. Students learn through revision and iteration with peer review tools like inline comments. How many accounts do I need for my class, school or district? WeVideo for Schools is offered as a multi-user license that is priced per user. When you purchase one license, that license provides a bundle of "accounts" (also called "seats"). Therefore you purchase a license based on the number of seats you plan to use. Every teacher, student, or administrator using the system will need their own login and should be considered a unique seat. Volume discounts are available for school and district purchases, and those discounts increase with the number of seats included in the order. The minimum purchase is a 30 user license. WeVideo individual licenses offer attractive pricing for requirements of less than 30 seats. What is a seat and is a seat required for every user? Everyone using WeVideo for Schools (eg. teachers, students and technology staff) requires their own account login. Each login is considered a seat and is a unique account. These seats can be allocated to a user and reallocated to a new person at no additional cost (for example at the end of a school year). Learn more. Yes. WeVideo for Schools allows your organization to re-assign seats. This is often done at the start of the year to allow incoming students to take seats that have opened up as last year's students have graduated or changed schools or classes. Learn more. How do you handle student privacy? Do you offer support and/or training? WeVideo is fully committed to the success of its education customers. Our responsive, expert education support staff is available to all paid WeVideo for Schools account holders. Our online Resources for Educators provide ready-to-use lesson plans, tutorials, tips and tricks. We also provide WeVideo Academy, a fully stocked web resource full of easy to follow videos on everything from getting started to mastering advanced features. We also offer professional development services directly and through some amazing partners. Contact education sales for more info. Can we use a Chromebook, laptop, desktop, or mobile device to edit on WeVideo? Absolutely! You can edit complex videos on a Chromebook, PC, or Mac and seamlessly continue projects between all of these so students are never bound to a single device. For creation on-the-go, you can use one of our mobile apps on iOS and Android. You can read about our system requirements here. Yes. Visit our pricing for education page and select the number of seats that you need. Click on Get a quote and follow the steps. After you complete the form, we will instantly generate a quote for you. When you are ready to purchase, you can retrieve your quote and convert that to an order. Questions? Contact WeVideo Education Sales. How does a school purchase or get a quote for WeVideo? A school, school district, university or other educational institution can purchase WeVideo for Schools with a purchase order or with a credit card. The price and quote generator on this page will take you through the steps to create a quote or pro forma invoice which you can share, modify or download. You will also find a link to our W9 and payment options. If you need assistance with a purchase, please reach out to us. I am not in charge of payment. What are my next steps? Visit our pricing for education page and select the number of seats that you need. Click on Get a quote and follow the steps. After you complete the information to get a quote, we will instantaneously generate a link which you can share with your decision makers and your procurement or business office so that they can complete the payment. You can also download the quote, pro-forma invoice and W9 to share via email or in print. Questions? Contact WeVideo Education Sales. How do I renew my WeVideo for Schools plan? We're here to help you. Contact WeVideo Education Sales and include the name and email address of the school staff member to whom the WeVideo for Schools account is registered. What are the monthly publishing limitations? WeVideo for schools allows every user to publish an hour of video per month. Published video refers to a video Edit that is complete and has been rendered into a final video. There is no limit on how long users can work in the application. Also, this hour per month limit is pooled. So if one user exceeds the limit, it will not be a problem as long as the summed total of available publish minutes for the entire account is not exceeded. If you think your school or district will exceed the publishing limit, contact WeVideo Education Sales for assistance. Does WeVideo for Schools work with Google Suite or Office 365? Yes. WeVideo for Schools has built in domain level sync with Office 365 and G-Suite. There is additional integration with Google Drive, Google Classroom, and Microsoft OneDrive, with more to come. Yes, but they are not intended for education groups. We know our school users might only do one or two projects per year, therefore our annual plans for education are heavily discounted to accommodate these requirements. Our monthly plans do not offer WeVideo's significant educational discount. It is also important to note that WeVideo for Schools includes significant, purpose-built features for schools. These features are not present in the WeVideo plans for individuals. These capabilities include stringent adherence to privacy and protection policies for students, assessment tools for teachers, and robust administration and management capabilities that scale to meet classroom, campus-wide and entire district requirements. Do you have single-user plans? Absolutely. While our Education plans have been carefully designed to deliver maximum value for classroom applications, we understand that there are instances where only a single user account is needed. If you do not require the collaboration, deep discount, and special education features, our Power and Unlimited plans each offer a complete, feature-rich video editing experience for individual users. Get more information and compare plans at https://www.wevideo.com/sign-up. What are WeVideo's plans to comply with the upcoming General Data Protection Regulation (GDPR) legislation? WeVideo will be fully compliant with GDPR when it comes into force. We currently collect the following information from our users - first name, last name, and email. The data is stored and accessed securely during the term of the contract. All data access is through secure SSL protocols. WeVideo maintains strict access control to ensure data is only accessed by users who have rights to it. On contract termination, all user data is securely returned and destroyed as directed by the user. WeVideo uses user data only for the purpose of fulfilling its duties under the agreement and does not share such data with or disclose it to any third party, except as required by law. WeVideo certifies that there has never been an instance where there has been a data breach or failure to comply with the data security agreement with a customer.